A Mexican folktale tells of Silvestre Guzman dancing with the prettiest girl. She had bright flashing eyes and glossy black hair. However, when he looked down, she had chicken feet. Her scaly claws should have been scratching around a farmyard, not dancing. In addition, the other men had horse hooves. He and his friends ran away and walked home in the dawn, thanking their lucky stars for their narrow escape. A fairytale this, but there might be danger with the chicken on our plates. The evolution of new farm methods into chickenization has brought negative consequences for both people and the environment. Just a century ago, chicken was rare and expensive. In the 1920s, the birds were pricey, seasonable and not especially tasty. Over the course of the twentieth century, both chickens and the industry exploded in size. The growth of the birds themselves can largely be explained by the miraculous effect of antibiotics. These drugs, developed to deal with human disease, have been fed to farm animals in vast quantities. Over time, farmers had to cede control to an industry and became “producers.” The new integrated model controlled the process from start to finish, beginning with breeding and in hatcheries, to the formulation of feeds and on through slaughter and processing. Americans appeared to want white meat, so the industry answered by breeding chickens with overdeveloped breasts and fragile legs (at the end of a growing season, many chickens would topple over). If the market wanted a more pleasing skin, some arsenic was added to the feed for less pale, pink flesh. Marigold extract to the feed was a good natural dye. 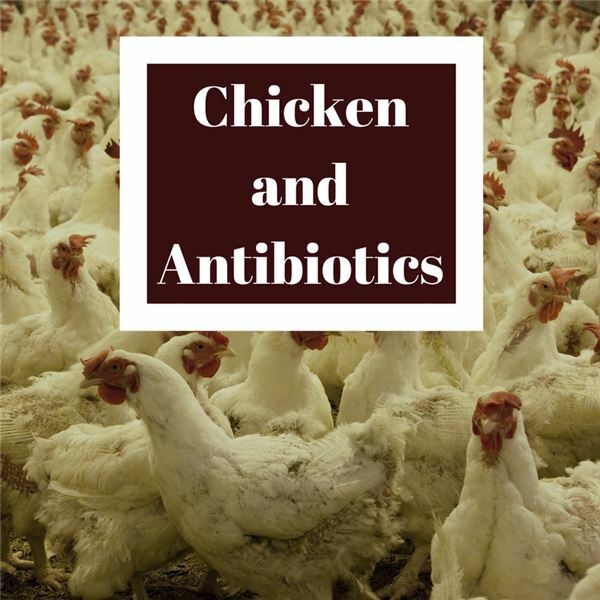 The Food and Drug Administration (FDA) calls the drugs that are added to feeds to increase the growth rate of chickens and other animals raised for human consumption growth-promoting antibiotics or antimicrobials (GPAs). Antibiotic comes from the Greek words meaning against life. The human immune system fights off bacteria; bacteria fight off one another. If a scientist extracts a naturally occurring substance from bacteria, they can create an antibiotic. Even though antibiotics are a factor of bacteria and mold, they are generally not harmful to humans. “Bacteriostatic” antibiotics stop or slow the rate of bacteria and prevent them from multiplying. Bactericides kill bacteria, giving the immune system a chance to kick in and finish them off. Antibiotics can interfere with bacterial cell walls or disrupt cellular processes, such as the building of protein. Antibiotics weaken bacteria’s ability to take in nutrients and expel toxins. They also keep bacteria from reproducing by interfering with the replication of DNA and, antibiotics can mimic nutrients, so it prevents the bacteria from picking up the real thing. In 1949, a scientist named Thomas Jukes was looking for a natural source of vitamin B12 to make animal feed healthier. He learned that waste products from the antibiotic chlortetracycline held large amounts of the vitamin. He fed the vitamin-rich mash to baby chicks. Since it contained a low-dose of the antibiotic, the chicks grew faster, got fatter and acted perkier. Soon the byproducts of antibiotic production, called growth promoters, were being fed to animals across the nation. Another benefit of the feed: the extra energy the animals did not use in fighting off bacteria that normally lived in their environment was channeled into growing bigger. In addition, the flock could be housed in smaller, confined spaces because they could now fight off the bacterial infections that go along with overcrowding. As a result, tiny cages are now stacked one atop the other and the waste from the chicken above dripped down on the food and water of the birds in lower cages. It is inevitable that bird droppings will contaminate the food and water. Therefore, if one chicken gets sick with E. coli for example, antibiotics are put in the drinking water for the entire flock. According to Mary McKenna, author of “Big Chicken: The Incredible Story of How Antibiotics Created Modern Agriculture and Changed the Way the World Eats,” animals, not humans, receive between 70 and 80 percent of all the antibiotics currently used in the United States. Often, livestock are kept on low doses of antibiotics their entire lives in order to promote growth and prevent disease, rather than fight a one-off infection. This practice is a major cause of antibiotic resistance. In addition, the tiny amounts of antibiotics in growth promoters do not kill off all the bacteria. They only kill off the weakest bacteria, allowing antibiotic-resistant bacteria to flourish. Wash fruits and vegetables before eating, especially those you will eat raw. Never allow utensils or dishes used for raw meat to touch cooked meat. Cook eggs, chicken and meat thoroughly and use a thermometer to test them. In addition, antibiotics are no defense for viruses. Question your doctor if you really need antibiotics. Get vaccinated for all major diseases. Practice good hygiene when you have a cold or sore throat. Despite the 100-plus powerful antibiotics in use, infectious diseases are the leading cause of death worldwide. Infectious diseases generally include those caused by bacteria, viruses or parasites. Many bacterial infections have become resistant to one, two or in some cases, all of the antibiotics that once easily cured them. Merritt, Robin. The Life Cycle of a Chicken. Mankato, MN: The Child’s World, 2012. Book. Philip, Neil. Horse Hooves and Chicken Feet: Mexican Folk Tales. New York: Clarion Books, 2003. Book. Frontline. The Trouble with Chicken: Inside a Major Salmonella Outbreak and a Broken Food Safety System. PBS WGBH, 2015. DVD. Goldsmith, Connie. Superbugs Strike Back: When antibiotics fail. Minneapolis: Twenty First Century Books, 2007. Book. Silbergeld, Ellen K. Chickenizing Farms & Food: How Industrial Meat Production Endangers Worker, Animals, and Consumers. Baltimore: John Hopkins University Press, 2016. Rosen, William. Miracle Cure: The Creation of Antibiotics and the Birth of Modern Medicine. New York: Viking. 2017. Book.